Steven came into week 3 with a clear plan, he broke down how it works into six categories: hardware, protocols, languages, data, networks, and ISPs. We brainstormed what might fall under each category—you can read more about the process and brainstorming here—and after some discussion we came up with one more category: software. Each student took one category and based on the brainstorming went off to research their work and popualte the wiki page for week 3 with what they found. We spent much of Tuesday discussing what they found, vetting the sources, and generally deciding on an agreed upon format. By Wednesday all the research was basically done and Steven kicked in part 2of his plan: the class would code their own resource page in HTML and style it with CSS. Learn how it works by creating it, baby! He guided us through a tutorial on how to write HTML, use a local editor, uploading .html pages and media to public_html through the file manager on cPanel (did I mention how much I love Domain of One’s Own for making this dead simple? ), exploring relative links, and generally playing with HTML. It was awesome, the entire class was actively learning how it works, and it was all business because it was directly related to the project at hand. Everyone was required to code the information for the topic they did their research on. On Thursday we reviewed each person’s HTML page to make sure they were working properly. After that, we dug into CSS (which blew me away because I didn’t think we could get that far). Steven asked the simple question, “How do we want out site to look?” We talked about inline styles, internal stylesheets, external stylesheets, the revoltuion of cascading stylesheets for design, and more. It was a fun discussion, and by the end of two hours everyone created their own local stylesheets thanks to Steven’s guidance, at the same time they all agreed on a very minimalist, yet effective, design for their collection of old gold HTML pages discussing how the internet works. Steven took up the rear with collecting everyone’s HTML pages via email, and then making sure the pages linked, the styles were consistent, and the links were realtive and posted it on his site. After that he sent me all the HTML pages, and I uploaded them to a subdirectory on the course site and they all work perfectly. Check out their “How It Works” guide custom-made in HTML and CSS lcoally in Fredericskburg, Virginia 🙂 Did I mention Steven was an auditor? How awesome is he? NOBODY!!! 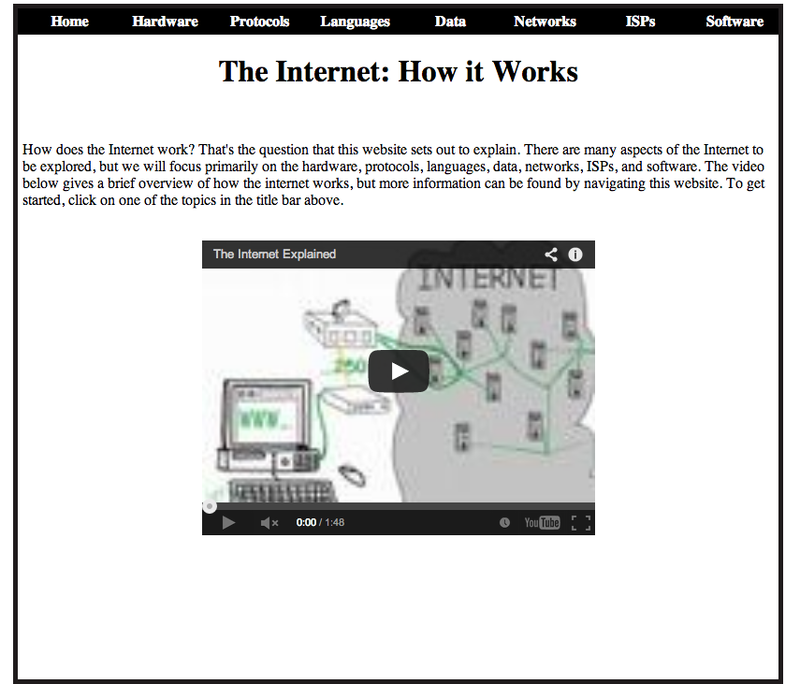 This entry was posted in The Internet Course and tagged howitworks, tic104. Bookmark the permalink.